Reviews for Remember Me Roofing Inc. The snow on my roof had covered the bathroom exhaust fan vents and also my plumbing vent. I have used Remember Me Roofing in the past, so I reached out to them to clear the trouble spots of snow. Chris gave me a quote, confirmed immediately via email and I had two of their men on the roof that afternoon. The two men that did the snow clearing were pleasant (in spite of the minus 20 degree weather) and professional and cleaned up when they were finished. Remember Me Roofing has consistently been a pleasure to deal with, have always been quick to communicate and deliver what they promise. They are my choice for any service they provide. I would not hesitate to recommend them to anyone who has need of their services. Thank you for writing this great review! This week has been very busy with similar projects, glad we could provide you with great service. Look forward to business with you in the future. After 20 years it was time for the roof to be replaced. I asked co-workers, friends and family for recommendations for roofing companies. A co-worker recommended 'Remember Me Roofing'. I got quotes from different companies and 'Remember Me Roofing'. What impressed me was the rating the company had with the 'Better Business Bureau' and previous customer reviews. Also that the owner came and provided the quote, not a salesperson. Everyone from the company was professional and courteous. They ensured that upon completion that the area was left clean. I would recommend this company for anyone needing any kind of roofing done! Excellent review, thank you for sharing about your experience working with Remember Me Roofing, and for the recommendation! We are glad we could stand up to our reputation and we appreciate your business and support. All the best! After plus or minus 20 years each house owner needs to look for a good roofer. With some research the name of Remember Me Roofing caught my attention. Giving a quote Chris, the owner, showed up on site. He gave me all the options, explained everything in detail and a reasonable, competitive cost. These things convince me not to mention the fact that nowadays many roofing companies don't meet up customers on the spot for quote anymore. Thank you for the great review! We appreciate the recommendation and we are thrilled that our confident staff could provide you with the comfort in knowing that your roof replacement has been completed to top quality standards. All the best! They were helpful in the selection of the roofing material, and started they job when promised. They completely the work quickly. They were courteous. They did a great job. They left everything super tidy. Thank you Kathleen for taking the time to write a great review. Following the May windstorm, we sustained damage to our roof. We contacted Remember Me Roofing who came out very quickly to survey the damage and provide a quote. Chris was very professional, provided several options and answered all my many questions. His team was great. They were polite, efficient and also funny. There were some challenges with the weather but that didn’t discourage them, they just worked around them. They did a great job and cleaned up the site really well. The neighbours love our new roof as much as we do. I highly recommend Remember Me Roofing! Found Remember me Roofing working in the neighborhood, as well as some co-workers who had used them and I was very happy with the thorough job they did. Really happy they were able to get us in before the snow started! Thank you for taking the time to stop by and leave a review! We are thrilled to hear that you were referred by some co-workers and we would like to thank you for your flexibility and patience with us while getting your roof completed in the colder weather. All the best! that the most probable cause was leaking around an air vent. replaced the air vent and further sealed the other vents. He showed us pictures of his work before and after the repair. We were extremely please with the professionalism and service. Thank you Gary for such a detailed review. This will go a long way in showing our customers the level of professionalism they can expect. We appreciate your business. Happy holidays! I am an out of country landlord who needed a new roof on my rental property. I never do things chintzy so I wanted a good roof that would last. I looked at all the five star reviews on Google and got quotes from all of them. After discussing roofs at length with each company, I decided on Remember Me Roofing. Jordan explained everything in detail with great patience. They made it easy do this from a distance (including payment via Interact and putting me on the schedule for the days I was in town) and I felt good about the warranty. I would certainly use them again. Thank you for such a great review! I will let Jordan know that his hard work to gain your business didn't go unnoticed. Our company always ensures our customers are making informed decisions and this email is a testament to that. Thank you for your business. Have a Happy Holidays! After many years, it was time for shingles to be replaced. The quote received from Remember Me was not quite the least expensive, but the appraisal approach was very professional and detailed. The work was completed in the time quoted. Property around the house was covered with tarps to collect debris, nails, etc. There was a small leak in the roof that had been corrected years ago by a different company, but the leak had come back. One of the Remember Me roofers actually entered the attic and saw the exact leak location. I was shown the leak, and the detailed repair, and it looks good. The previous company was very good, but they did not take that extra step. Also, two metal channels are now added to the lower roof to direct water to the eaves, instead of running down the shingles as was done in the past. The new style shingles even look better. I have always believed that the lowest price is not necessarily the best, and that you get what you pay for. That is true in this case. I now feel confident that the roof will protect my house for the coming winter and many more. Now I can relax knowing that the slight extra cost was well worth it. Thank you, Ed for the amazing review! And thank you for choosing our team for your roof replacement. We are happy that we could get your roof leak repaired for you. Your satisfaction is the greatest reward we could ask for so thank you for sharing. Take care! In the past two years I have had bad experiences with two different roofing companies. 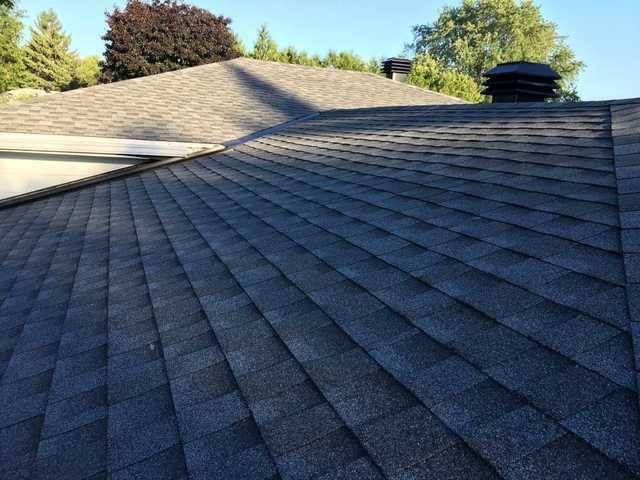 The second company installed a brand new roof which not only caused serious condensation problems but they also installed a new vent which leaked all winter and spring long. I contacted a few other roofing companies for an estimate. Most of them never got back to me. Some came but never sent the estimate. Then I contacted Chris from REMEMBER ME ROOFING. He was knowledgeable, polite, came up with constuctive ideas, and sent me an estimate which I found very acceptable. His crew came in a timely manner and, again, were extremely polite, thourough, competent, and clean.Jessica informed me about every step of the work and was a pleasure to talk to. I also had two new eavesthroughs installed and Renee did a wonderful job with those. I was very impressed with REMEMBER ME ROOFING and will highly recommend them to all my friends. Excellent review! Thank you kindly for taking the time to share on your experience working with Remember Me Roofing. We are thrilled we could provide you with a superior experience from start to finish. Happy Holidays! More about Remember Me Roofing Inc. Remember Me Roofing Inc services residential and commercial properties in the Ottawa region, offering industry leading 50 Year Warranties through our certification as GAF Contractors. Our highly rated team takes pride in delivering quality workmanship and providing outstanding customer service to every homeowner. We emphasize honesty and integrity and are proud of the reputation we have built in our community and our commitment to give back. Every member of our staff strives to make Remember Me Roofing a leader in the industry. Beyond providing a service, we are looking to build relationships by committing to being reliable and respectful to our customers. Our homeowners depend on us and we in turn give everything we have to each roof. A GAF 50 Year lifetime Warranty roof is our preferred system to install. We are GAF Certified contractors. We are specialized in Re-roofing, skylights, new construction, venting upgrades, leak repairs, snow removal and water proofing.